It’s all about networks. Understanding networks that is. This is the shift our organizations, institutions, and society must make in order to thrive in an always-on, interconnected world. This is a quote from Harold Jarche’s blogpost It’s all about networks in 2012. What people like Harold Jarche are doing through their work is noticing what’s happening, taking seriously what it is they are noticing, thinking critically and sharing publicly. This capacity to share learning and enrich both their thinking and others is of great value. This capacity and willingness to share is connected to Ubuntu, from African culture, and roughly speaking translates as – my humanity is your humanity or I in you and you in me. To have Ubuntu is to have a generosity of spirit that understands our interconnectedness and acts for the benefit of all. 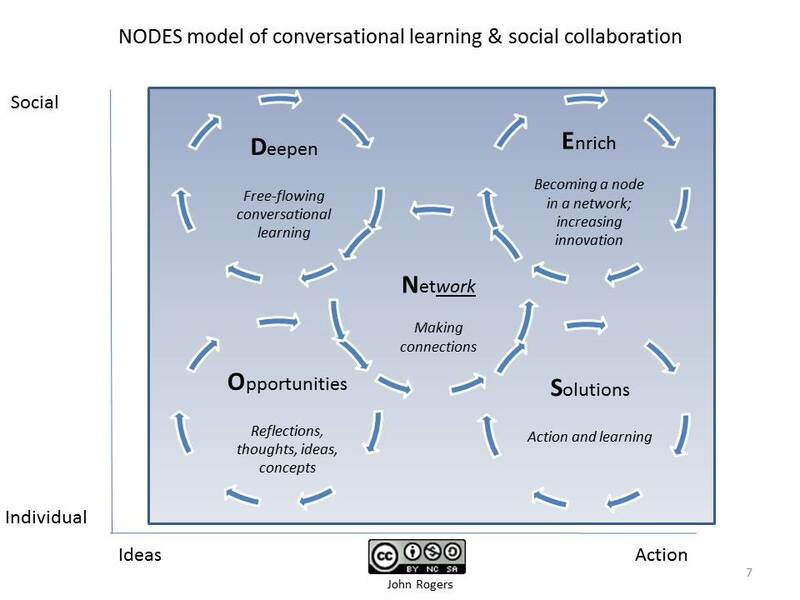 I’ve developed the NODES learning model to help me make sense of how learning in networks happens. The model does not give preference to any particular method of learning per se. 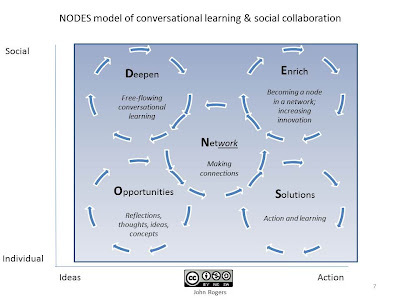 What’s critical to learning in a networked world is participation; connecting ourselves and our individual ideas with our network. In the model I am using the word network in two senses. Firstly, network as a noun within which we participate as nodes, i.e. a central or connecting point at which lines or pathways intersect or branch. Secondly, network as a verb in which the focus is on the work of connecting and operating within a network. This model is emergent and has evolved through my own learning interests. It is still a beta version despite several interactions already. It has been deepened through a number of informal conversations with friends and colleagues, for which thanks. It has been enriched by the generosity of spirit shown by those who have shared their ideas, many of whom I have never met. This process continues and your comments and feedback are welcomed and encouraged.